Bill de Blasio's Civic Experiment - Is It Working? 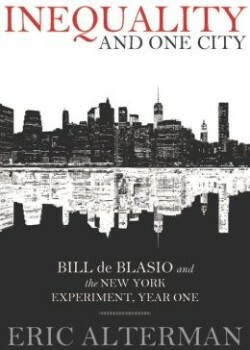 Journalist Eric Alterman talks about his new book, Inequality And One City: Bill de Blasio and the New York Experiment. It’s about how the New York mayor is using city government to implement his agenda on inequality, the forces arrayed against him and the contradictions he faces. And then, we hear poems from Richard Wilbur and Jonathan Wright. There’s a fight brewing over the soul of the Democratic Party between the party’s center-right establishment, typified by Hillary Clinton, and the party’s progressive wing, represented by Elizabeth Warren and Bernie Sanders, both of whom have made America’s high and growing economic inequality the touchstone of their work. And while the centrists have begun paying lip service to concerns about inequality lately, it’s too early to tell whether their record will match their rhetoric. One politician who ran on a progressive platform now has a little more than a year of governance under his belt — that’s New York mayor, Bill de Blasio. He ran on a platform of bringing more economic and social equality to the city’s residents. Has his record matched his rhetoric? 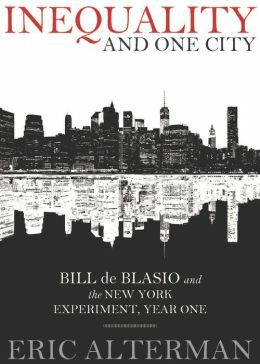 Journalist Eric Alterman’s fascinating new book, Inequality in One City:Bill de Blasio and the New York Experiment, Year One, looks at that record. Alterman says that to many people’s surprise, including his own, de Blasio is on track to enact his platform. But de Blasio’s progressive program faces strong headwinds — a governor who seems bent on undermining him, a Republican ruled legislature in Albany, a hostile police force, charter school advocates and corporate interests that are among the most powerful in the world — the moguls of Wall Street and real estate. He has to thread a difficult path that avoids alienating the powers that be while not disappointing the voters whose hopes are riding on him. Even if de Blasio does make real headway on correcting some of the worst impacts of inequality, will his achievements outlast his administration? And what does his approach — using the mechanisms of government itself to effect change — mean for the country at large? Eric Alterman teaches journalism at Brooklyn College and the CUNY Graduate School of Journalism. He also writes a column for The Nation and is a senior fellow at the Center for American Progress. Alterman is the author of nine previous books, including the national bestseller What Liberal Media? The Truth About Bias and the News. Inequality and One City is available as an e-book from The Nation, as well as from Amazon.com. More from Eric Alterman on Bill de Blasio and how the media treats him. This week’s show features the poem “Calendula” by Jonathan Wright from his recent poetry collection, After The Rain. Also, Richard Wilbur reads “Advice To A Poet” and “The Barred Owl.” Hear our full interview with him here.